After an attempt at rolling his new kayak in our swimming pool, Landlubber Ed (who does not swim and has only been in a kayak once before) decided that what with wearing his new Mountain Equipment Co-op PFD (which he calls a PDF) he was more than ready to brave the waters of Vaseux Lake for our inaugural voyage. 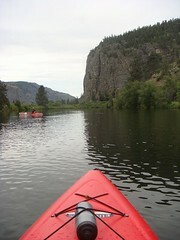 Besides the natural beauty of the area, Vaseux Lake is perhaps the best place in the southern Okanagan valley to test a new kayak – as the lake is restricted to non-motorized vessels. The only hazards therefore are wind, waves and the effluent of wild geese. With the requisite Starbucks fortification on board, we hit Vaseux at just after 8AM while the lake was still completely calm. From where we parked the truck just south of the boardwalk, we paddled to the north end of Vaseux lake where the water is barely waist deep. No noticeable signs of stress on Ed’s face, I decided to retrace the trip my friend Pam and I did in a voyageur canoe last year during the Meadowlark Festival all the way down to McIntyre Bluff at the south end of the lake and back. 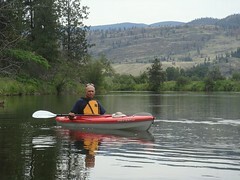 With the channel flowing into Vaseux Lake from the north end, padding southbound is a cinch. We cruised along the west shore and crossed over to the island at the narrows. From there we hit the second channel, where the current picked up some steam and we were at McIntyre Bluff in no time flat. The site of a battle between the Shuswap and the Okanagan Indians, the vertical cliffs of McIntyre Bluff rise 250 meters, towering over the narrow pass through which Highway 97 runs. Although we did not see them this time, a small herd of California bighorn sheep resides in the rocky hills and usually come down to the lake to drink in early morning and evening. Just before we reached the dam and as we turned around to head back north, the wind picked up. With arms already tired, we decided to take a break in one of the inlets where I discovered that our lunch was back in the car and then dropped my camera in the lake. At that point, my mood sunk (stunk), and while I thought paddling against the current and the wind in the channel was a chore, when we hit the lake again it became a concern as the kayaks started to bounce against the whitecaps. “Remain calm – show no sign of concern” I thought as I checked to make sure Ed was still OK. Apparently oblivious to the peril, Ed looked happy as all get out. So, after confirming that the shorter crossing with a direct crosswind wasn’t an option, I pressed on directly across the lake, our longest stretch of water yet. On finally reaching shore, I asked Ed if he had been at all concerned about the wind and wave action. He responded, “Nah, if it had gotten that bad, we could have gone downwind and hit the south shore, no problem“. Somewhat sheepishly, I replied, “Hmmm… I never thought of doing that“. Hi Rosalind – Ed was really brave considering he doesn’t even swim. I’m thinking of emigrating to your country, so I’ll be searching through your blog for all things Canada. Now, I was wondering about swimming pools. I always wanted an outdoor pool, but it’s way to cold here in the UK. 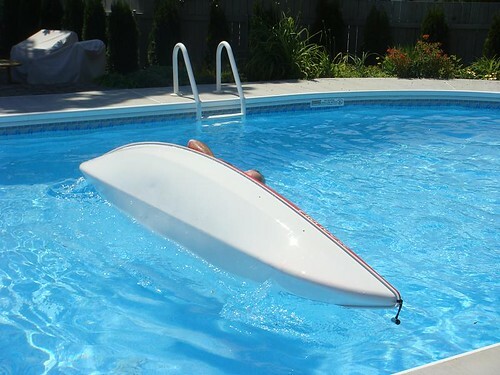 How many months a year is it realistically possible to use your outdoor pool in Canada?